A tombstone needs to be erected over the unmarked grave known as sane heterosexuality. On April 14, 2004 the black community killed heterosexuality and left in it’s wake a community obsessed with every move and mannerism in a sad attempt to determine who is gay and who is straight. “R.I.P. 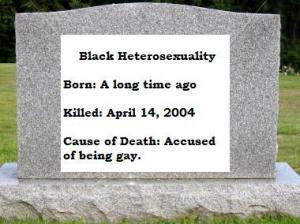 to Heterosexuality” the tombstone should read. You see ever since the rise of the sensational and pathologic notions about sexual orientation and sexual identity that swept the country and particularly the black community around the year 2004 the black community has been literally the walking dead when it comes to addressing the sexuality of members in it’s community. We have become zombies fresh for human brain, but the brain we hunger for is any sign that a black man is gay. Take for example a recent picture of NBA player Chris Bosh. TheYBF.com, http://theybf.com/ a black blog notorious for fanning flames of homophobia and gender rigidity was quick to lead the foray into speculating on the sexual orientation of Chris Bosh. A caption under the picture read, “Oh…ok Chris,” which in the black community generally means that an implication of homosexuality is at play. The comments on TheYBF.com weren’t any better, comment after comment accused the basketball player of being on the down low, one of the gays, and everything in between. It would be one thing if incidents like this were the exception, but the black communities lynch mob like dealings with sexuality have led me to conclude that sane heterosexuality is dead. Somewhere in 2004 when JL King was given the platform to peddle his misinformation and outright lies to gullible black women, the black community killed off heterosexuality and left in its place a community scarred. No one is heterosexual in the black community, especially black men. Every black man is a leg crossing, pink shirt wearing, limp wrist, pedicure away from being gay. Every move a black man makes is seen through the lens of whether or not he is one of the gays. I hate to say it but heterosexuality is dead in the black community and the black community is who killed it. We all took knives and stabbed heterosexuality in the stomach, arms, and neck. We all gleefully murdered heterosexuality to benefit our own ignorant notions about gender performance and sexual orientation. We happily watched heterosexuality die and patted ourselves on the back when it did. If we didn’t think that HIV was doing a good enough job of tainting our notions about sexuality in the black community, our obsession with masculine performance and the “Down low” stupidity surely drove black heterosexuality to an early death. I suppose we can pay our respects and give resolutions and acknowledgements to that short lived heterosexuality that once seemed to be somewhat respected in the black community. But April 14, 2004, heterosexuality has been dead in the black community.